Social media is broadly viewed as a source of useful information and as one tool in parenting toolkits. 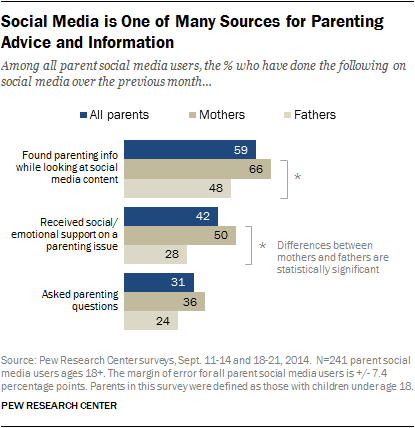 Mothers use social media as a parenting resource slightly more often than fathers. While a large share of parents find value in social media as a general information resource, fewer say that they come across useful parenting information while using social media. At the same time, two-in-five parents who use social media say they got support from their networks for parenting issues over the past month, and mothers who use social media are nearly twice as likely as fathers to say they get support. A majority of social media users and parents agree that social media is a source of useful information. More than three-quarters (79%) of parents who use social media agree that they get useful information from their social media networks, including 32% who “strongly agree,” a proportion similar to that of all social media users (75%) and non-parents. While parents are avid users of social media, not all seek it out as a primary parenting resource. 59% of parents have come across useful information about parenting while looking at social media in the last month. Mothers who use social media are particularly likely to encounter helpful parenting information while looking at social media content – 66% have ever done so in the past 30 days, compared with 48% of fathers. A third of mothers (34%) say they “sometimes” get helpful parenting information from their social networks, and an additional 10% say this occurs “frequently.” This compares with 14% of fathers who “sometimes” find useful parenting information on their social networks and 3% who do so “frequently.” Furthermore, fathers are more likely than mothers to say they “never” come across useful parenting information on social media– 51% vs. 33%. Parents living in households with an annual income of less than $50,000 are somewhat more likely to come across useful parenting advice with greater frequency –10% do so “frequently” compared with 4% of higher-income parents on social media. Conversely, affluent parents are more likely to say they “hardly ever” come across useful parenting information – 37% say so compared with 15% of less-affluent parent social media users. 42% of social-media-using parents received social or emotional support around a parenting issue on social media in the last month. Parents use social media for support around parenting topics, although they do not necessarily do so particularly frequently. Overall, 42% of parents who use social media say that in the previous month, they received social or emotional support around a parenting issue on social media, while 58% said they never received such support. Just 8% of parents on social media said they received this kind of support “frequently,” over the previous month, while 16% said they did so “sometimes” and another 18% said this “hardly ever” occurred. Mothers are again more likely to experience this support on social media. Half of mothers on social media said they received social or emotional support about a parenting issue over the previous month, including 11% who say this happens “frequently” and another 22% who said it occurred “sometimes.” This compares with 28% of fathers who had received this kind of support over the last month. Another 72% of fathers on social media said they had “never” received social or emotional support about a parenting issue, a significant difference compared to the 49% of mothers who say the same. About a third of social-media-using parents have asked a parenting question of their social media networks in the last month. Some parents on social media ask questions of their networks about parenting issues, but they do not do so frequently. Overall, 31% of parents had asked parenting questions of their online social networks over the previous month. Just 3% asked such questions “frequently,” while another 10% did so “sometimes” and 18% said they “hardly ever” did this. Fully 69% of parents on social media said they “never” asked questions about parenting over the past 30 days. There are no significant differences between demographic groups.